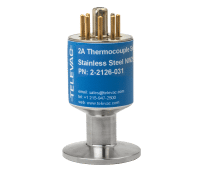 The Televac 2A thermocouple vacuum gauge has a measurement range from 1 × 10-4 Torr up to 1000 Torr. It indirectly measures absolute pressure by detecting the thermal dissipation of a filament. The 2A can be operated by several Televac controllers, including the MX200, MM200, MC300, MX2A, B2A, Compact 2A, Vacuguard, and MV2A. MX2A Active Thermocouple Gauge – This gauge utilizes an easily replaceable Televac 2A thermocouple vacuum sensor. It has a variety of features including a wide range of measurement from 1 × 10-4 Torr up to 1000 Torr, RS-485 communications, two programmable set points, and a selectable analog output. The bright OLED display makes it easy to read from a distance. Options can be set from four capacitive touch controls located on the top of the unit or through RS-485 communications. The extensive selection of fittings, simplicity of use, ease of sensor replacement, and competitive cost make this unit an excellent choice for a variety of vacuum applications. 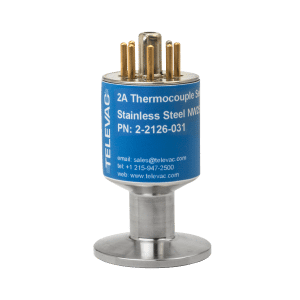 4A Convection Sensor – The 4A convection sensor has a measurement range from 1 × 10-4 Torr up to 1000 Torr. 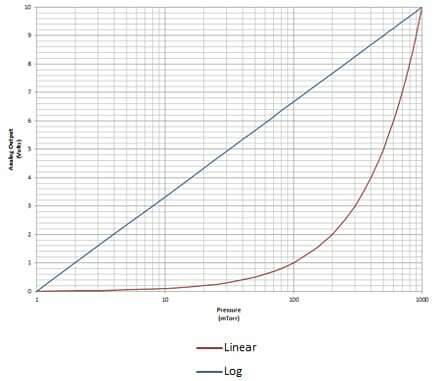 The sensor features a rapid response time when compared to typical thermal sensors. It indirectly measures absolute pressure by detecting the thermal dissipation of a filament. The 4A can be operated by several Televac controllers, including the MM200, MC300, and MX4A. MX200 Vacuum Controller – The Televac MX200 controls up to 10 Televac vacuum sensors including cold cathode, convection, diaphragm, and thermocouple sensors. It also includes RS-232/RS-485/USB with and up to 8 optional set point relays. The user interface includes six touch controls and a high contrast, 180° viewing angle green OLED screen, which displays the units of measurement and the set point status simultaneously. Multiple gas types are supported. The MX200 is a modular unit, allowing you to choose a vacuum sensing solution specific to your needs.